When a dark meteorite - or a dark alien craft as large as the meteorite - heads for earth, will we be able to see it? At first glance I thought, when taking into account the things of page 1 of this storyline, that in stead of emitting light to the outside it would absorb the light that would have made it visible. So no, except maybe for a small dark shadow between the stars and a very slightly enhanced rate of space expansion around it, we will not be able to see it. Is this true? And what happens when it collides with the earth? A meteorite, bright or dark, is supposed to be inactive. It is supposed to have no internal heat source or residual heat from earlier processes to sustain any light emission in its own frame of reference. Interstellar space is cold, about 3 Kelvin. So matter and antimatter alike, apart from any sun it will not emit nor absorb radiation other than the usual temperature radiation at 3 K.
When the film of a light reflection is played backward, the reflection of an individual photon preserves the same chance of occurrence. A ray of light - the photons - doesn't seem to notice whether they are reflecting on matter or antimatter. From a sole bunch of reflections you can say little about the direction of time. Light reflection is quite time symmetric and shows no arrow of time. 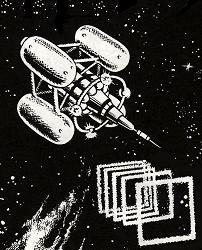 So when your spaceship enters an antimatter solar system, it can probe the system by emitting a strong radar signal. Since all reflections will be time symmetric, the pulse will bounce off as usual, on matter as well as antimatter. At first glance you even will not be able to distinguish between matter or antimatter. So at earth, in the case described above, you can see the antimeteorite by a strong radar pulse. A sun is radiating light in all directions. Let's follow a piece of a narrow bundle of light, a fixed amount of photons, that is emitted in one sun second. The bundle of photons heads for space, on its way diverging a little. Suppose at a certain moment the bundle hits a mirror and it is reflected at some angle, now heading for somewhere else in space. The bundle diverges more and more and on its way one photon after another is absorbed by different goals at different (eventually very different) times: dust and gas in outer space, the atmosphere of a planet, a city on Earth, the retina of a person that sees the light. Suppose now that the Sun was a dark star, as observed by us. (We experience ourselves, our planet, as normal matter - we always do. And the Sun is antimatter now, backward time evolving dark antimatter.) In the dark sun's own frame of reference things just happen as described in the previous paragraph. In our frame we “see” the light going towards the dark sun and the dark sun absorbing it. If we follow the photon paths, to the mirror and to its sources, we end at dust and gas in space, in atmosphere molecules, the houses of a city, the retina of your eye, all at eventually very different moments in time. In our frame we cannot conclude otherwise than that the molecules of the gas and dust in space, the molecules of the air and the molecules of the walls of the houses and that of your retina, are stimulated to emit light towards the mirror. And they do so in such a manner that, when finally arriving at the mirror and being reflected, they form the original bundle the dark sun did emit in its own dark frame. Our retina is sensitive for incoming photons to excite molecules there. The retina is NOT sensitive to photons radiated by the retina itself, not even when these emissions peak out from a normal thermal emission spectrum. (That is, not as far as I know.) So we will not see our planet (nor any eventual anti planets, or the dark meteorite) in the light of the dark sun. Light originating in a dark sun is “drawn from” matter, as we called it at several places, drawn from it in an anti-entropic fashion. If our retina was sensitive to it, likewise as in “Observing dark galaxies” in the column at the right of page 2 of EXPANSION OF THE UNIVERSE, we just could see a dark sun and could see all objects around in its dark light. Let's return now the dark antimatter sun back into our own original Sun. Our Sun isn't dark to us. Its light reflects likewise on matter as well as antimatter after which it can be seen by us. The antimatter meteorite from the first paragraph above will be visible in the light of our Sun. Or as mentioned by a strong radar pulse. All this is not violating the second law of thermodynamics. It is not against it, it is only very very unlikely to happen this way. But it is not forbidden. Of course, under normal circumstances you cannot expect these things to happen, but these are not normal circumstances. Significant amounts of antimatter are involved. Time is supposed to run backwards there and anti-entropic behavior is expected. Shall we call it Stimulated Emission of Radiation by Backward Time Evolving Matter? But well, we don't know such a thing as backward time evolving matter from observation. We DO know antimatter and when we assume antimatter to evolve backward in time, it becomes Stimulated Emission of Radiation by Antimatter or SERA. What happens when the antimatter meteorite collides with Earth? When its dimensions are about 10 km diameter, the results of the impact (compare the meteorite that did extinct the dinosaurs) are combined with the results of “millions of atom bombs” because of annihilation effects. I guess the atmosphere of the Earth will not do much in the annihilation process, it is too thin. When the front of the meteorite touches the Earth surface, then things go wrong. The matter-antimatter explosion of the meteorite's front will bounce off a substantial part of the rest of the meteorite back into outer space without annihilating. It is difficult to estimate how much. We start from gravitation as presented at page 3 in the storyline NEWTON EINSTEIN KIEKENS GRAVITATION GRAVITATION and theorem (6.1) at paragraph The calculation of the time border at page 2 in the storyline THE EXPANSION OF THE UNIVERSE. To judge whether contracting shells or expanding shells dominate in a point in space, we did compare the gravitational field strengths there. The largest field strength dominates and sets the direction of time. Where contracting and expanding field equals, there is the time border. Imagine a cloud of test clocks, released above the Earth atmosphere and initially at rest relative to the Earth. When free fall starts, clocks along the Earth radius will increase relative distance (due to field strength is larger when nearer to the Earth). While in the directions perpendicular to that, clocks will approach each other (they all head for the same point, the Earth center, and thus approach each other too). The effects of the gravitational field of the Earth on a test clock is anisotropic, different in different directions. In some directions we had to conclude to an expansion while in other directions we see a contraction of local space. By considering the field strengths only we avoid this complication. Consider the antimeteorite at the moment its front touches the Earth surface. For convenience we take the meteorite as spherical and homogeneous (same density all over the volume). Radius of the Earth = 6.38 * 10^6 m.
G = gravitational constant, r = distance from test-proton to mass center of the dark meteorite, m(x) = mass of object x, R(x) = radius of object x.
Gravitational field strength of matter and antimatter have to equal at the time border. Let's take the radius of the meteorite to be 1/1000 of that of the Earth, a reduction from 6378 km to 6378 m, diameter 12756 m, while maintaining shape and density. Then m(antimeteorite) reduces by a factor 10^9 from 5.97 * 10^24 to 5.97 * 10^15 kg. Over the volume of the meteorite the gravitational field of the Earth is nearly constant then. The gravitational field of the antimeteorite can be taken as spherical, being proportional to 1 / r . Therefore we can take the time border as a sphere. At paragraph The calculation of the time border at page 2 of THE EXPANSION OF THE UNIVERSE is derived that the time border indeed is a sphere. Now for the time border around the antimeteorite. r = 2.02 * 10^2 or about 200 m radius. The time border lies deep within the dark meteorite. But wait - as described in A sphere of free falling clocks at page 1 of NEKG, when you are IN a spherical mass of homogeneous density, the gravitation of the complete shell “above” you (“above and around” you) cancels out and can be neglected. The spherical volume “beneath” you, the rest of the mass, is the only part that attracts you. When you are x times nearer to the center of the spherical mass, then the spherical volume “beneath” you has decreased with factor x^3 and so does the mass “beneath” you. The mass “beneath” you can be thought of as being concentrated in the point at the center. When you are x times nearer to that point, then field strength increases with x^2, according to the Newton law of gravitation. The net gravitational strength, when going into a spherical mass, diminishes with x^3 / x^2 = x, the field strength IN the Earth or IN the antimeteorite is proportional to 1/x. The gravitational strength is largest at the surface of the spherical mass. Inside as well as outside the gravitational field is weaker. As a consequence, at the surface of the antimeteorite its gravitational field strength is at maximum. And when it is smaller than that of the Earth at the Earth surface - and it is - it certainly will be so in the inside of the antimeteorite. There is no time border present inside the antimeteorite. The only time border present are the “tight jackets” as described in paragraph The calculation of the time border of page 2 of EXPANSION OF THE UNIVERSE. So all constituent particles of the antimeteorite interact forward time evolving. As observed by us, the antimatter from the antimeteorite emits to the Higgs field, in doing so enlarging it. Expanding shells in bright vacuum form a repulsive gravity. The matter of the Earth absorbs from the Higgs field, in doing so reducing vacuum. Sagging in shells then form ordinary gravitation. Where the flow of expansion equals the flow of contraction in magnitude, there is the time border. But the flows don't have to cancel each other out to zero. They do at the point of the time border that is most distant from the Earth. But at the opposite point, nearest to the Earth, the flows add. It is opposite behavior from gravitational field strengths in matter-matter reactions. See paragraph Dark and bright planets and stars of equal mass at page 2 of THE EXPANSION OF THE UNIVERSE.